I thought long and hard before deciding how to share my experience as a first-time cruiser. Now that I have cruise experience, I realize that there was so much I didn't know before I left, I didn't even know the questions to ask. So I've decided to draw directly from my travel journal, allowing you to learn about the cruise experience as I did. I hope you find this "Diary of a First-time Cruiser" to be useful as you plan your own trip. Tomorrow I leave on my very first cruise. I'll be cruising through Alaska's Inside Passage on Norwegian Cruise Line's new Norwegian Pearl. I'm a little excited, a little anxious. I'm wondering how everything I want to bring is going to fit in my suitcase. I imagine I'm not much different from most first-time cruisers. My choice of destination came first. Alaska was at the top of my list of travel goals for 2007. 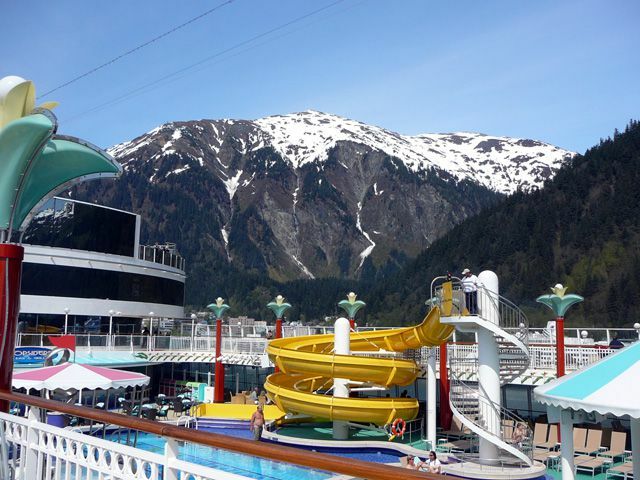 A cruise seemed like a great way to see several Alaska destinations without having to haul luggage around to a new hotel every night. However, I'm a casual sort of person. I hate to be fussed over, dressing up, and set schedules. Norwegian Cruise Line's Freestyle Cruising®, with its many dining and entertainment options, seemed like the perfect choice for my first cruise adventure. The fact that I could depart from and return to Seattle, my home city, was another reason to choose NCL. Finally, the Norwegian Pearl is a brand-new ship, specifically designed for Freestyle Cruising. Will my cabin be too small and confining? Will I be the only person under 50? Under 60? Learning about Alaska history and culture. I've been so nervous all morning, I'm not sure why. Guess it's because I'm doing something totally new and unfamiliar? My friend dropped me off at Seattle's Pier 66 about 1:30 pm; the Norwegian Pearl was scheduled to depart at 4:00 pm. Boarding had started at 1:00. There were lots of people milling about and buses and taxis coming and going. A sign directed me to the baggage drop area, where I stood in a short line before showing my ticket and ID and dropping my luggage off at security. The luggage tags I had received with my cruise confirmation packet were already attached to my bag. After dropping off my large bags, I again followed the signs, which led me out of the building and then back into another entrance and up an escalator to the ticket "windows". There were so many crammed in there it was amazing! The line moved quickly and I soon presented my ticket, ID, and credit card to the ticket agent and received my stateroom key card. From there I walked across a couple ramps to the ship. As I walked onto the ship I passed by a station where I was shown how to use the hand sanitizer. It turns out that these sanitizer stations are all over the ship, at entrances to every restaurant, restroom, and elevator. You simply put your hand under it and some quick-drying sanitizer squirts into it and you rub your hands together. Everyone is urged to use them before entering a restaurant or returning to ship. They also advise everyone not to shake hands. By the end of the cruise, everyone was making jokes that their hands had never been so clean in their life. After the hand sanitizing, I passed a photographer on the promenade, who snapped my picture in front of a green backdrop. Background Seattle scenery was added digitally. I quickly found my outside balcony stateroom and was taken aback at first by how compact it is. No spare room at all, and there's hardly room enough to turn around in the toilet compartment. After dropping off my carry-on bags, I left my cabin to check out the ship. The common areas around the reception desk and shore excursion desk were quite crowded. My first impression was that the ambiance was like a casino, in terms of both decor and noise level. I then headed up to the spa, got a quick tour of the facilities, and made some spa appointments - a high priority on my list! As the Norwegian Pearl pulled away from Pier 66, we were called to our lifeboat drill. The cruise director gave plenty of warning about what to do and what to expect, so it was really no big deal. When they gave the signal, everyone is to go to their room, grab one of the life vests located in their closet, put it on, and proceed to the designated mustering area via the stairs. Our area was inside the Summer Palace dining room, which seemed a little odd to me. Odd, but comfortable. The crew member assigned to oversee our mustering area checked each person off from their list of names, and then we all sat there for about 10 minutes before being excused to return to our rooms. Quick and easy! I returned to my room and unpacked my suitcases completely. By the time everything was out, hung in the closet, or stowed in drawers or shelves, I realized that the cabin might not be too big, but it was big enough. Room for everything and every activity, but no more! After unpacking, I headed out again. The common areas were a lot less crowded now - guess everyone was settling in. I stopped by the Shore Excursions desk to get reservations for a Butchart Gardens tour in Victoria. Then I wandered around and decided to have dinner at the Lotus Garden, the Asian Fusion restaurant. I enjoyed a delicious meal of spring rolls, crab and corn soup, and a BBQ pork and veggie noodle dish. I finished up with a warm banana pancake with coconut ice cream. By the time I returned to my room and went through all the reading material and special notices that had been left for me in the room it was 9:30, so I decided to call it a night. The first full day of my Alaska cruise adventure has not started out so well. Once we hit the open waters on the west side of Vancouver Island, the waves became rough. I hardly slept at all during the night and this morning I feel awfully motion sick. Sitting around my cabin I wasn't feeling so bad, but as soon as I got out and walked around, I found I felt really awful, really fast. I had to beat a fast retreat back to my room. I definitely learned a lesson there - don't go to the upper deck, particularly fore or aft, when the sea is rough. I went back to my room and lay down, hoping to get myself under control before my 11:00 spa appointment. Unfortunately, the spa is located on Deck 12 Forward, so heading up there did not help me at all. As long as I sat in one place, it was tolerable, but as soon as I started walking around, I was miserable. My seaweed wrap and massage were wonderful and relaxing, but by the time I made it back to my room, I was miserable again. Alex the concierge called to invite me to dinner with the Captain that night. Food of any kind did not sound at all appealing at that point! Alex had room service bring me some ginger ale and crackers. I lay down for a while, and then had the crackers and ginger ale and started feeling a lot better. It helped that we were again in protected waters, so the waves where only "moderate", not “rough”. I talked to Alex again and confirmed dinner with the Captain, following the Captain's cocktail hour. Then I took a nap. Dinner with the Captain was a wonderful experience. The evening began with cocktail hour in Spinnaker Lounge, where I was quite excited to get a peak at my first humpback whale off in the distance. First I saw the whale blow, then the tail. During the cocktail hour I got my picture taken with the Captain and then chatted with some other guests and crew. I also met several officers - there sure are a lot of them! Dinner was at Le Bistro, the intimate French restaurant on Deck 6. We were seated in a private alcove. My dinner companions included the Captain (from Norway, of course! ), a young lady entertainer from Ireland, and two couples who were traveling together from Las Cruces, NM. Dinner was absolutely wonderful; the service was gracious and pleasant. I had a warm goat cheese tart, cream of mushroom soup, duck a l'orange, and chocolate soufflé. Needless to say, my motion sickness wasn't bothering me anymore! The dinner conversation was lively and stimulating. It was very interesting to hear the Captain’s point of view on world affairs, since he was an intelligent and well-traveled guy. And not from the US. I slept like a baby last night and feel great this morning. Nothing makes you appreciate good health like a bout with seasickness. The sky is clear and blue and we are now in the Alaska Inside Passage. There are snow-capped, forested islands all around. Before breakfast, I enjoyed a walk around the promenade deck, taking a few snapshots of the Pearl’s common areas. During my stroll I saw some more whales, a couple quite close to the ship. After breakfast I wandered around deck 12, 13, and 14, taking a look at the outdoor recreation areas. There was a jogging course, golf driving cages, a tennis/basketball court, the rock climbing wall, and more. I returned to my room to relax for a while, viewing the gorgeous scenery passing by. I saw several humpback whales and porpoises from my deck. Again, some were very close to the ship. We arrived in Juneau around 2:00 pm. It was quick and easy to get off the ship as soon as we were cleared at the dock in Juneau. At the bottom of the ramp everyone got their picture taken with a local mascot. For Juneau, it was a bald eagle The Norwegian Pearl was at dock AJ, the one farthest from the port shops and attractions of downtown Juneau. You could walk the mile to downtown, but most people took advantage of the convenient shuttle to the Mt. Roberts Tram station. From there, I walked through town, checking out the shops as I went, as well as the local scenery. My destination was the Alaska State Museum – along the way I walked past the Alaska State Capitol building. Juneau is on a hill, so I had to walk down several flights of scary stairs to reach the museum. The kind that are made out of metal screens. I hate those! While the stairs weren't fun, the views from the various stair landings were spectacular. The Alaska State Museum had a nice collection that included natural history, Native art and culture, the era of Russian possession, the transition to American possession and statehood, the gold rush, and tourism and the promotion of the state. They also had a special exhibition of art jewelry at the time of my visit. As someone who is into both history and Northwest Coast art, I found my museum visit to be quite worthwhile. As I walked back down to the main shopping area, I passed the St. Nicholas Orthodox Church, a charming blue-and-white structure. I also passed through a residential area of small older homes. I was rather disappointed with the shopping I found in the port at Juneau. Most of the shops seemed to be either overpriced jewelry or tacky tourist items. The shops that stood out were Gallery of the North, Raven's Journey, Norwesterly, and Caribou Crossings. I purchased some art, which I arranged to be shipped home. I also bought some fresh-made candies and souvenir T-shirts. At this point I was worn out from all the hilly walking, so I returned via shuttle to the ship and enjoyed a quiet dinner at La Cucina. I had an antipasto platter (served from a traveling cart), penne with carbonara sauce, grilled veal with mushrooms, shrimp with artichoke hearts, and chocolate velvet cake with vanilla cream. We docked in Skagway, where we would spend the entire day, at 6:00 am. While the people who went on shore excursions were required to get off the ship quite early, I decided to enjoy a leisurely breakfast before heading out. From the ship, Skagway appeared to be a model small town, with its colorfully painted buildings nestled in a valley, surrounded by snow-capped mountains. It was a short walk to town from the dock. I walked through town and headed for the first destination on my itinerary, the Gold Rush Cemetery and Reid Falls. It was quite a walk to get there (almost two miles from the dock). However, it was quite pleasant and scenic, passing first through downtown Skagway and then through a residential area. Afterwards I returned to explore the town, including the shops and galleries and the charming Skagway Museum. I returned to the ship after 3:00 pm, ready to get off my feet. I had time for a short rest before attending a Murder Mystery Dinner at 5:00 pm. Those of us who had signed up for the dinner met in the Bliss Ultralounge and received our instructions and scripts. We then proceeded to the Summer Palace dining room and enjoyed our dinner, acting out the mystery between courses. I played to role a famous New York model and I was not the murderer. For dinner I had spring rolls, caeser salad, tilapia in coconut sauce, and a baked apple in pastry. The food, the activity, and the company were all delightful. After dinner I headed for the Stardust Theatre, where I watched a showgirl dance review show called Sea Legs. It was more prancing about and posturing than dancing. I enjoyed the female singer and the beautiful costumes, but other than that it was mainly a showcase for legs and bottoms. The men enjoyed that, I’m sure! This morning the ship entered Glacier Bay National Park. I took advantage of room service and had a light breakfast in my cabin. It was simple coffee, juice, and a small muffin, but it suited my needs at the time. I was able to look out from my balcony and enjoy the gorgeous Glacier Bay views, including Reid Glacier. I was fortunate to be invited to view Marjorie Glacier from the Bridge, along with about a dozen other fortunate cruisers. The ship slowly made its way towards the glacier, then stopped just under a half mile away from the glacier and made a very slow 360 degree rotation. Everyone, no matter where they were located on the ship, had ample opportunity to view the magnificent blue-white glacier and some local wildlife. A National Park ranger came on board and made a presentation, which could be heard over the ship’s loudspeakers or by tuning into your cabin TV. He also answered questions. The Captain and the crew maneuvered the ship with tiny adjustments to create currents that moved larger icebergs away from the ship. Ice bergs, both clean and dirty, floated all around. The water was very still and overall the atmosphere was one of chill and quiet. We spent about one hour at Marjorie Glacier before exiting Glacier Bay. Viewing the glacier from the Bridge of the Norwegian Pearl was truly a once in a lifetime experience. As the ship headed back out of Glacier Bay, I enjoyed a hot stone aromatherapy massage that was wonderfully relaxing. While waiting for my appointment, I enjoy a fabulous view of the La Plugh glacier from the windows of the women's locker room lounging area, which is on Deck 12 forward. Incredible! After my massage, I took in a late lunch at Cagney's. I had crab and jicama dip, a shaved turkey sandwich with apple celery salad on a multigrain baguette, and Boston cream pie. This was one of the best meals of the cruise so far! After an afternoon of relaxation in my cabin and a shower, I enjoyed a Tex Mex dinner at Mambo's. I had bean and cheese taquitos, chicken fajitas, and cinnamon churros with chocolate mousse. During dinner I enjoyed a window view and saw several passing herds of seals. That evening I took in the 7:30 magic/comedy show in the Stardust Theater, featuring Bob & Sarah Trunell. The magic was utterly cheesy, but it was still funny and entertaining. The Norwegian Pearl docked at Ketchikan at 6:00 am. Since we had to be back at the ship by 1:00 pm, I left the ship around 6:45 am. Fortunately, all the places I wanted to visit opened around 8:00 am, as they were used to accommodating cruise ship schedules. I stopped at the visitor and tour center located right at the dock and picked up a walking tour map of the town. While things were still quiet I walked around the downtown shopping area and the Creek Street area, taking picture of the shops, attractions, and scenery. A few shops were already open. We had been blessed with sunny weather for most of the cruise, but the morning here in Ketchikan was chill and overcast, in keeping with its rain forest setting. I returned to the ship and had a lunch of cream of broccoli soup, croque monsieur, and Linzer torte at Cagney's. Then, on to the spa! I arrived early for my appointment and spent the time relaxing in the lounge area. I had an aroma flex massage, which was half a back massage and half foot reflexology. Very nice! Dinner that night was at Teppanyaki. The chefs that cooked the meal at the table were very funny and good-natured. Most of their “act” consisted of flipping around their spatulas and salt and pepper shakers - for some reason, I was expecting knives to be flying. They wore their knives in a Wild-West-style belt holster. Everyone at the table was served miso soup and a cabbage and sea vegetable salad. The chefs then cooked an appetizer of jumbo shrimp and grilled veggies, cracking jokes throughout the process. They also prepared garlic fried rice. Each person at the table was able to order their own main courses, which were also cooked right before our eyes. That made it a little awkward, as each entrée was finished at different times. I enjoyed chicken and steak, followed by a dessert of coconut ice cream. After dinner, I attended the show Garden of the Geisha in the Stardust Theatre. It was by far the best entertainment of the cruise and included music, dancing, and aerial acrobatics. The acrobatics made me rather nervous, as the couple who performed swung out over the audience as they did their thing. After the show, they had a special good bye from the crew where all the officers, chefs, and representatives of the other crew departments came on the stage and sang a farewell song to enthusiastic applause. Later that night at 10:00 pm there was a chocoholic buffet in the Garden Café. A considerable crowd formed waiting for the buffet to open. The spread included chocolate cakes, pastries, ice cream, fondue, and edible centerpieces. I enjoyed a slice of blackforest cake and a mini éclair. We're at sea all day today until our evening arrival in Victoria, BC, so I decided to sleep in today. I had a late, light breakfast of a croissant and scrambled eggs at the Great Outdoors buffet on Deck 12 Aft. At 10:15 am I attended a disembarkation briefing in the Stardust Theatre to learn about luggage tagging and transfers, customs, and when and how to go about getting off the ship. In addition to the presentation, they had already provided us with luggage tags and written instructions covering everything one might want to know. During the afternoon I lounged in my room, watching a movie and enjoying the scenery as we passed through the Straight of Juan de Fuca. I also took care of some financial business at the reception desk and made a last look through the photos posted in the photo gallery. I decided to purchase a picture of me taken on the dock in Ketchikan with a person dressed in a moose costume. It made me laugh! I spent the extra money for a nice folio for the print that included an evening photo of the Norwegian Pearl. We arrived at the cruise ship dock in Victoria around 5:30 pm. I took my time getting off the ship, as I had signed up for a 6:30 pm bus trip to Butchart Gardens. Once off the ship, it was easy to pass through Canadian customs and to find the right tour bus. It took the bus driver about 45 minutes to drive us out to the gardens, following a scenic rural route. The gardens were fabulous and colorful. We had two hours to spend in the Gardens before we had to return to the bus. It took just over an hour to walk through the whole garden, including the sunken garden, the rose garden, and the Japanese garden. I then spent some time wandering through the Gardens' art gallery and gift shop before returning for a second, more leisurely wander through the sunken gardens. It was dark by the time the bus returned to the downtown area. The bus driver took us on a short tour of the downtown and inner harbor area. When I returned to the ship I had a light snack at the Garden Café and then went to bed. I woke early and packed my bags - somehow I got everything to fit! I took my time getting off the ship. Disembarkation went from 7:30 to 9:30 am, with people getting off the ship in color-coded shifts depending on their travel plans. I had signed up for express walk-off, where people who were capable of taking their own luggage off the ship could just walk off whenever they were ready. I enjoyed a leisurely breakfast of challah French toast with berries and mascarpone. Walking off the ship was fairly easy. There were lines at the gangway and to get on the elevator, but they moved fairly quickly. The line through customs – at least for US citizens – moved efficiently - we basically just handed them our forms and walked on through. As is common in the travel industry, the writer was provided with discounted accommodations, meals, and/or recreation for the purpose of reviewing those services. While it has not influenced this review, About.com believes in full disclosure of all potential conflicts of interest. For more information, see our ethics policy. Where Did the Russians Settle in Alaska?